Equipment Gambling: Can You Afford It? admin November 21, 2017 Comments Off on Equipment Gambling: Can You Afford It? Is it really gambling if you know you’re going to win? One printer asked me that and, well, yes, it is. Fact is most gamble with significant financial decisions instead of investing. What’s the difference? In an investment, you can only lose the investment. In a gamble, you may lose the business, the house, the car, and even the spouse. 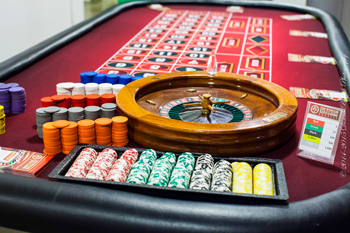 Here are thoughts on whether you can afford to gamble or not. Focus on the downside risk instead of the odds of winning. That means, can you afford to lose the entire investment in equipment (or a salesperson or whatever)? For instance, would you rather take a gamble where you have 5 out of 6 chances of winning or one where you have one in a million odds of success? Most say the 5 out of 6. But there’s not enough information. The 5 out of 6 is a game called “Russian Roulette.” Lose and you die. The one in a million is spending $1 on the lottery. Lose and so what? In business that means maintaining a 2:1 current ratio (currents assets / current liabilities) AFTER you make the investment so you can afford to lose the entire gamble without losing the company. You should also do this calculation with days’ cash on hand and not drop below 30. Don’t “hard wire” expenses. If I “buyout” $5,000 worth of products or services each month, then buying equipment that would cost me $2,000 a month to do the same would be a great investment? Not so fast. We only buyout products and services when we need them so the total cost is variable. Sign up for the equipment and we’ve converted $2,000 payment into a fixed expense that we must pay each month whether the sales are there or not. Do this too much and we will strangle our business on our equipment payments. Focus on your checkbook and avoid “phantom benefits.” Buy a piece of equipment that allows you to produce something twice as fast and you’ll save time to do even more sales. That’s the sales pitch. Well, don’t count your chickens before they’re hatched. Follow the money. If you do this deal, you will deduct the payment from your checkbook each month. Now, if you need fewer people and terminate someone or cut some other expense, then those dollars may be used to offset the cash going out. But unless you do, don’t count it. Cutting the time to produce something in half will not automatically give you more sales. Might give your workers more time to take breaks though. Focus on all your needs at one time. Don’t just justify one purchase decision at a time. Do an inventory of all your needs. While you might be fascinated with some digital do-dad, it may be that investing in bindery equipment would give you a faster payback. That means you’d get you money back sooner and then be able then to make another purchase. When purchase decisions are justified one at a time, they’re always doable. Always choose from among alternatives. Finally, just because it’s urgent to the salesperson doesn’t mean it’s urgent to you. Salespeople have quotas usually every quarter. Just because they need to sell a machine by the end of the month doesn’t mean you must make a purchase decision by then. Do you need it? Can you afford it (downside risk)? Is it the best purchase among your alternative needs? Think of your business first, not the salesperson’s needs. And while we’re at it, stop thinking of equipment purchase decisions in the form of payments. You know, I have $1,000 of payments dropping off and that didn’t kill me, so I can afford to obligate the business for another $1,000 of payments. Not necessarily Buying equipment is a balance sheet play in that it’s your current ratio and days’ cash on hand that determines whether you are squeezed financially or not. Don’t be spooked either. Just because the salesman says your competitor is buying one, doesn’t mean they are. Or doesn’t mean they can afford it. Or doesn’t mean it will put you at a competitive disadvantage. Fact is, might just be the move that puts your competitor out of business and you dodged a big ole silver bullet. 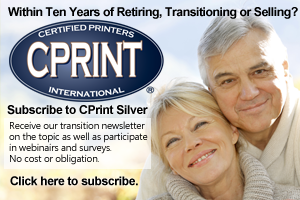 Message Tom Crouser at tom@cprint.com for more information on how CPrint International can be of help to you in your business or call his cell (304) 541-3714. No cost or obligation.